Volvo has been building its reputation as a manufacturer of smaller cars for some time, which was quite a difficult task given that Brits used to associate it with its big, safe, boxy saloons and estates. When the Volvo S60 arrived in 2000, it was clear that the company had decided to give its German rivals something to think about. Safety has always been a priority for Volvo, and so the S60 upholds its reputation with unsurprising assuredness. Side impact protection, dual air bags up front and side airbags for further security are included as standard across all models. Volvo didn't mess around when it looked to capture the compact executive car market with the S60, and as such, you'll be impressed with the overtly aggressive and sporty styling. Although the Volvo S60 is compact, it doesn't feel it. You'll really notice the roominess in the rear, where long-distance comfort and space is assured for passengers of all sizes. If you're concerned about safety, then investing in a used Volvo is one of the best things you can do. The Volvo S60 lets you enjoy your protection in sporty style. 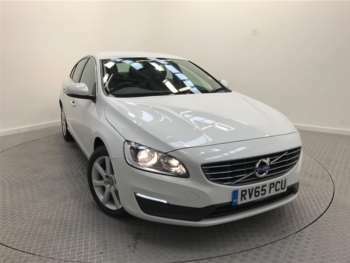 The benefit of choosing a used Volvo S60 over a competing car from another manufacturer is that you'll be getting much more value for money, mostly because the badge just isn't quite as desirable. There's plenty of power available even on the 2.0 litre turbocharged base model, while the T5 and R offer serious performance for petrol heads. Of course the diesel engines are more efficient and great for people who will be burning through fuel on a regular basis, so there's something for everyone. Got a specific Volvo S60 model in mind?